Removing your make-up at the end of the day is an absolute must! These days, though, it’s not a case of simply splashing with soap and water. Most modern make-up is formulated to be long-wearing, which means it will adamantly resist removal if you don’t choose the correct solutions. The removal of eye make-up is a delicate operation, especially if you’re a fan of the holy trinity of eyewear: liner, shadow and mascara. You’ll need to tread carefully between removing it effectively, and keeping your delicate eye-zone skin looking and feeling great. Pulling and dragging this fragile skin runs the risk of crow’s feet and sagging, so a gentle formulation is a must. Apply either a liquid or cream eye make-up remover onto a cotton wool pad and gently place over your closed lid, pressing gently for about 40 seconds. This allows the remover to penetrate any stubborn particles of make-up and dissolve them. Next, sweep the pad over your eye lid, and down over the top of your lashes to remove all eye shadow and grime. Use a different pad for each eye for maximum hygiene. Skin regenerates itself at night and needs to breathe in order to repair itself correctly. However, taking off the layers of foundation, powder, concealer, sebum, pollutants and dirt is no mean feat. 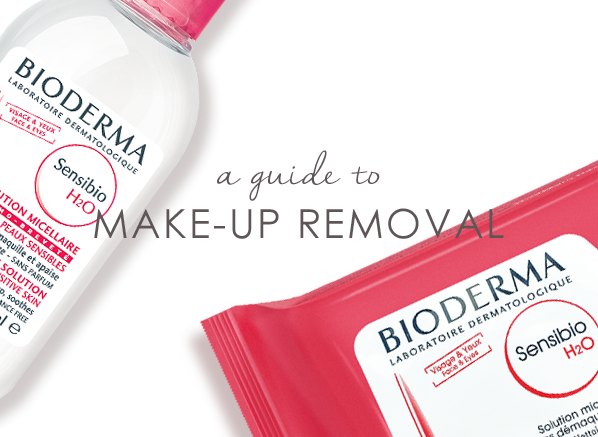 To restore your skin’s equilibrium, some serious make-up removing power is needed! Apply a few generous blobs of cleanser to the face and massage all over, not forgetting the sides of your nose and your neck. Next, take a fresh cotton wool pad and sweep it firmly across your forehead, taking care to press against rather than pull the delicate skin. Use gentle but firm movements to remove all of the cleansing lotion, using a fresh cotton wool pad with every stroke. Finally, saturate a new cotton wool pad in a refreshing toner to remove the last traces of cleanser, remembering to sweep it over your eyebrows and the sides of your nose, where gunk can accumulate. It may seem as if lipstick is self-removing, and whilst older formulations certainly were, these days most are designed to last all day and will require specific removal. The lip area is very delicate, so using a gentle moisturising cream cleanser will help to maintain the moisture equilibrium of your mouth. Smear the cream generously, not forgetting to smile whilst removing so that the product reaches any stray colour pigments lurking between the creases. With a cotton wool pad, gently wipe each lip in turn, using downward strokes for the upper lip, and upward strokes for the lower lip (this way you won’t induce fine lines and wrinkles by pulling the skin in different directions). Unlike the face, don’t use a toner afterwards as it can dry out this already parched area. Simply apply a layer of super moisturising lip balm and you’re all set! This entry was posted on Monday, January 10th, 2011 at 2:43 pm and is filed under Hints & Tips, Make-up, Make-Up, Shopping Guides. You can follow any responses to this entry through the RSS 2.0 feed. You can skip to the end and leave a response. Pinging is currently not allowed.